Walkie-Talkies sure are a great thing. Much more than a funny name for a children’s toy. Walkie-Talkies are the quintessential long-range communications device for when landlines are out and mobile reception is not an option. They have been used by explorers, police and security forces, the military, backstage film and theater crews and hobbyists for decades now with great success. But Walkie-Talkies aren’t just confined to the adult world. As there are numerous models accessible enough, both in terms of price and features. It can be used by children of nearly all ages. Let’s filter through this already bloated market segment and see what’s what, shall we? 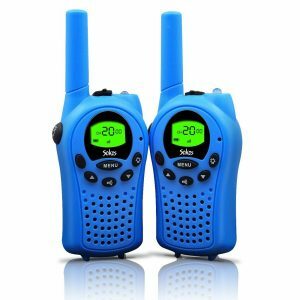 Here are the best Walkie Talkie for kids, starting below. 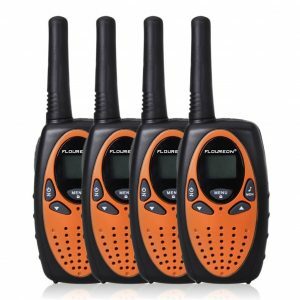 Below are the popular walkie talkies on the market right now. As a simple walkie-talkie solution, the Sokos doesn’t succeed with particular grace. A mess of buttons populate all sides of the device, which may be a little complicated if you’ve never used it before. And that goes for both us adults and minors. After a sort of introductory phase of getting used to the controls, though, the Sokos does feel pretty intuitive. As you keep using it, you notice those myriads of buttons, as wildly-placed all about the device as they are, are actually pretty ergonomic; in fact, the whole device’s shape is. Power is supplied by AAA batteries; the device can hold up to 3.5 hours of charge, 9 if put into standby mode. This particular item can be a great option for gifting a boy child. 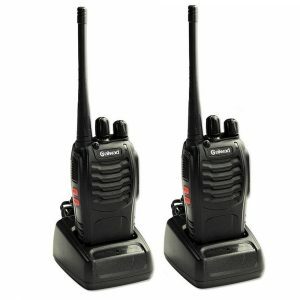 With a great range of over 3 miles, above-average sound quality and a price of only $27 for a pair, the Sokos 22-channel Walkie-Talkie are a noteworthy budget-friendly option, even if a bit hard to get used to at first. A pretty sophisticated-looking device. 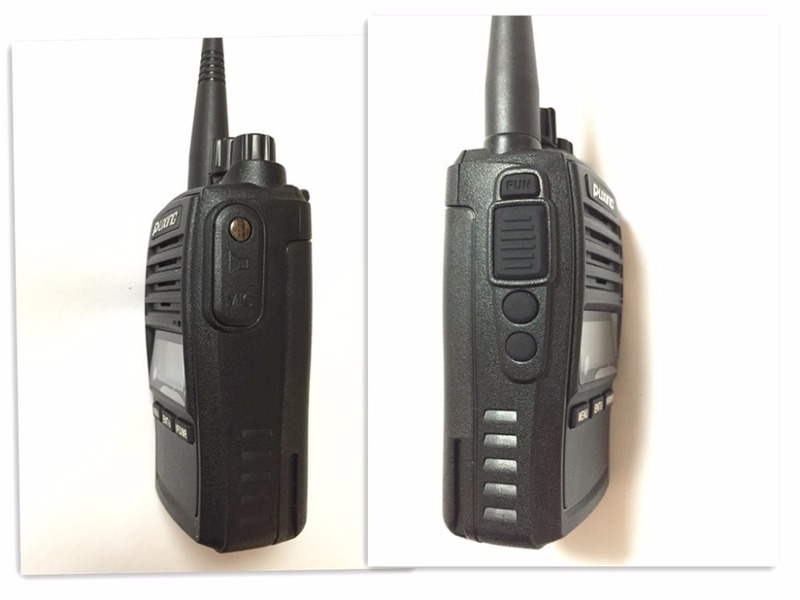 The Floureon Handheld Walkie-talkie, also referred to simply as a ‘portable radio’ in documentation by the manufacturer, features 22 channels, 3 miles of range. And a simple, phone-like design with few buttons and a small LCD display. Batteries required are of the AA kind, 3 per device, and a full charge should last for a few days’ worth of use, varying between makes and types of batteries. Note that rechargeable AAs can be used with the Floureon. Easy to use, effective and, judging by its appearance alone, rugged and reliable. Those appearance do not deceive in this case, as we found the Floureon to be indeed very well-made and capable of surviving some strenuous outdoor use very well. Its wireless performance may not set records and even audio quality is not the best we’ve ever heard. But the build is tough, will stand the test of time and we found that $37 for 4 devices is a great deal. Though some Walkie-Talkies can be used with third-party rechargeable AAA or AA batteries, a proprietary solution is usually more reliable and the charging process easier. The Swiftion Rechargeable Kid’s Walkie-Talkies feature four Ni-MH batteries each, which can be recharged by just plugging the device into the nearest wall socket, no disassembly required. Time between charges is about 4 hours, enough for a couple days of regular use. While this is a definite convenience, the Swiftions aren’t slouches in other aspects of performance, either. Let’s go through the numbers: 22 channels, 2 miles of range under normal conditions, $35 per pair. Additionally, you’ve got a few useful gizmos, like VOX, which, when triggered by pressing the corresponding button once, allows a voice-activated transmission to be sent without needing to press and hold the regular PTT button, or the handy built-in LED flashlight. All in all, the Swiftions are of great value, not just due to the rechargeable batteries, but also thanks to great all-round performance, a number of useful features rarely seen on other Walkie-Talkies and the attractive low price. 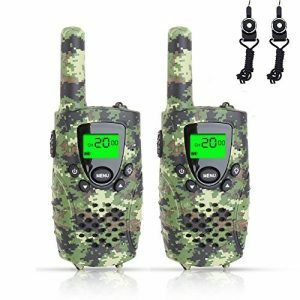 Another set of rechargeable Walkie-Talkies, the Ammiy Galwad sport an old-school design with analog volume and channel controls, no LCD screen and few colored buttons on the side. Instead of a simple wall plug, they come shipped with a phone-style tabletop charger. The build quality is great overall, owing much in part to the dial-based controls on top, which feel much better to use than small, plastic buttons. But even parts like the antenna and some of the side buttons possess much better fit and finish than we expected. Overall, the Galwad 888S scores great in this regard. With over 3 miles of range and some of the best sound we’ve heard from a device in this price category, performance is commendable. 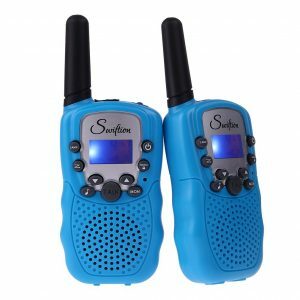 The retro look is attractive, and the analog controls, rechargeable power and great sound quality all make the 888S one of the best options out there for a child-friendly pair of high-quality walkie-talkies. For only $25 at that, value for money is amazing, too. Perhaps more obviously designed with kids in mind than any other device on our list, the FAYOGOOs sport a camouflage design, illuminated LCD screens and modern button-based controls. With a built-in flashlight, excellent 4 miles of max range and a durable, fall-resistant build, they consistently impress in every way. Some advanced features are included as well, like VOX hands-free calling, custom call tones and external mic and headphone support. 3 AAA batteries power each device, with support for rechargeable batteries included. Smaller than most other walkie-talkies, the FAYOGOOs nevertheless feel sturdier than most. The price of $27 might feel hefty, but the general build quality, amount of features, kid-friendly design, rechargeability and versatility are more than enough to justify the slightly higher than average cost, we find. So, it is up to you, then. Shall it be a high-quality pair that is simple to use, or a discretely child-friendly solution, optimized for younger users from the getgo? Retro or futuristic? Long range or suburban only? These and many others are the questions that you’ll have to ask yourself to determine which of our top 5 picks really are the best for you and your child.